Halcyon trim weight pockets help to enable optimal weight distribution, encouraging proper trim, diving comfort and in-water stability. Members earn 71 Points on this purchase! Halcyon tank-mounted trim weight pockets are yet another novel Halcyon invention. This patented product helps to enable optimal weight distribution, encouraging proper trim, diving comfort and in-water stability. While at the surface Halcyon weight pockets promote a heads-up position counter-acting the positive buoyancy of buoyant cylinders. However, these same weights support a horizontal position while underwater, reducing effort while encouraging diving fun. 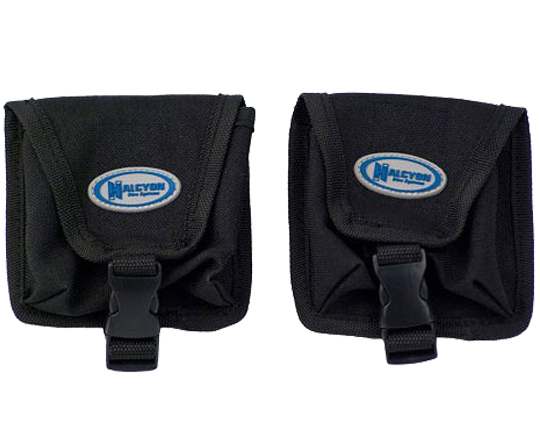 Pockets securely hold up to 5lbs/2.27kg of weight per pocket. Built with 1000 denier nylon with a hook and loop closure – this sturdy buckle helps ensure the weight stays in place. Designed to fit securely on tank straps. These are excellent for the travelling diver – allowing you to add extra weight to your system once you arrive at your diving destination. Sold as a set. Includes 2 pockets.